The most-expensive American car, British car and pre-war car are amongst the records set at RM Sotheby’s Monterey 2016 classic car auction. 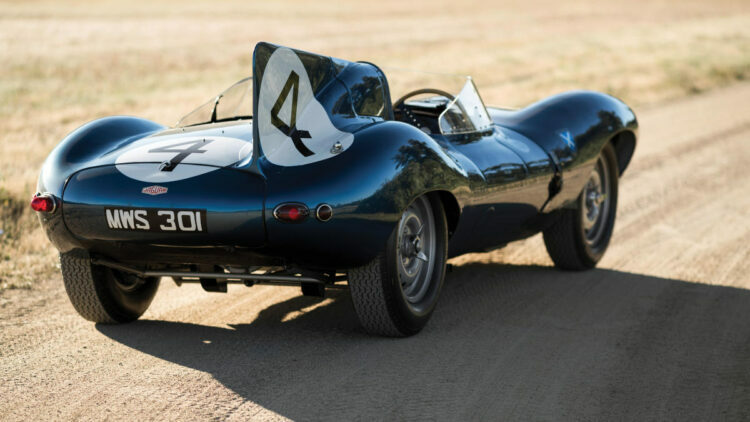 A Le Mans-winning 1955 Jaguar D-Type was at $21,780,000 the top result of all auctions at Monterey / Pebble Beach / Quail Lodge 2016 and the most-expensive British made car ever. The first Shelby, a 1962 Shelby 260 Cobra, chassis CSX2000, achieved $13,750,000 as the most-expensive American made car ever sold at auction. A 1939 Alfa Romeo 8C 2900B Lungo Spider sold for $19.8 million as the most-expensive pre-Second World War car ever. RM Sotheby’s sold 21 cars for more than a million dollar each during Monterey 2016. The annual RM Sotheby’s Monterey classic car auction was held on August 19 and 20, 2016, in California, USA. Three cars were sold for more than $10 million including the seventh and eighth most-expensive cars ever. In all, 21 cars were sold for over a million dollar compared to 35 (at the bigger auction) in 2015. RM Sotheby’s grossed $117.9 million from the just over 100 cars on offer. In 2015, RM Sotheby’s set a record when $172.7 million was made from 150 cars offered at three days of sales in Monterey. A 1955 Jaguar D-Type sold for $21,780,000 at the RM Sotheby’s Monterey 2016 sale to set a new record for a British car sold at public auction. It was also the highest price paid for any car during the Monterey 2016 auction week. This was the first time over $20 million was paid for a British car and the price was the seventh highest ever recorded. The record-setting Jaguar D-Type won the 1956 Le Mans 24 Hours race outright as an Ecurie Ecosse entry driven by Ninian Sanderson and Ron Flockhart. It is the only Le Mans winning Jaguar C or D-Type to have survived unaltered from its original race-winning form. A new auction record was set for a pre-Second World War car when $19,800,000 was paid for a 1939 Alfa Romeo 8C 2900 Lungo Spider with coachwork by Touring at the RM Sotheby’s Monterey 2016 sale. This is also by far the highest price ever paid for an Alfa Romeo. It is also the eighth highest price ever paid for a car at auction. Although the early history of the car is unknown, and the chassis was separated from the body for several years, the bidders clearly believed that the body and chassis belong together. As only 7 Touring Spiders were built on the long chassis, out of only 32 2.9 cars ever built, the history was easier to believe than would have been the case in less unique cars. The 1962 Shelby 260 Cobra, chassis CSX2000, stirred intense interest at the RM Sotheby’s Monterey 2016 auction as this is the original, first Shelby Cobra ever built. The result did not disappoint – at $13,750,000 the Shelby 260 Cobra became the most-expensive American car ever sold at public auction. It is one of only three American cars ever to have broken the $10 million barrier. A 1956 Ferrari 250 GT Berlinetta Competizione Tour de France sold for $5,720,000. This is one of only nine wearing the original style bodywork. It competed at the Mille Miglia in 1956 and the Tour de France series in 1959. A 1955 Ferrari 750 Monza Spider sold for $5,225,000 to set a new model record. The car was raced in period by Phil Hill, Carroll Shelby and Jim Hall. A 1908 Rolls Royce 40/50 HP Silver Ghost Tourer by Wilkinson sold for $990,000. Gooding and Bonhams had million dollar results for similar pre-First World War cars. A 1962 Ferrari 268 SP by Fantuzzi that remained unsold despite a highest bid of $12.5 million. A 1958 Ferrari 250 GT LWB California Spider that had a highest bid of $9.4 million rejected.